In December 2017, the Chico Poker Network introduced Windfall, its version of lottery poker sit-n-gos. This gaming provider is now following up by expanding the Windfall lobby with two new forms of randomized prize pool contests: Jackpot and Flips. All three styles of Windfall, including the original format, are live on the network sites: Sportsbetting.ag, TigerGaming, and BetOnline. Both of the new games retain certain characteristics of Windfall. They're all three-player matches with shallow starting stacks and random elements. They're also winner-takes-all affairs the overwhelming majority of the time. 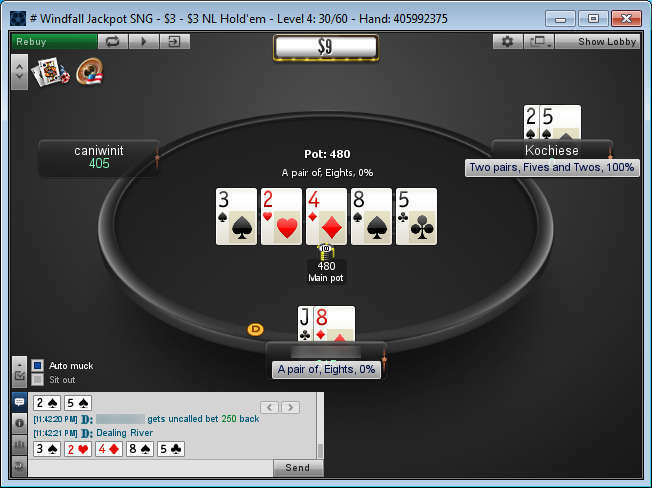 However, both Jackpot and Flips have unique wrinkles that differentiate them from run-of-the-mill Windfall poker. The Jackpot Windfall games combine the usual lottery-style gambit of selecting a randomized multiplier with the added possibility of winning a progressive jackpot. When the jackpot is hit, 85% of the pool is distributed to the participants in a 65%/25%/10% breakdown with the remaining 15% of the fund carried over to reseed the pot. The jackpot accumulates through a special 2% fee that adds on top of the normal rake of 5.67%. The house doesn't dip its hands into this 2%, which is quite refreshing to see. By contrast, in the cash game Bad Beat Jackpot, the Chico Poker Network extracts 15% of the BBJ pool for “administrative fees”! 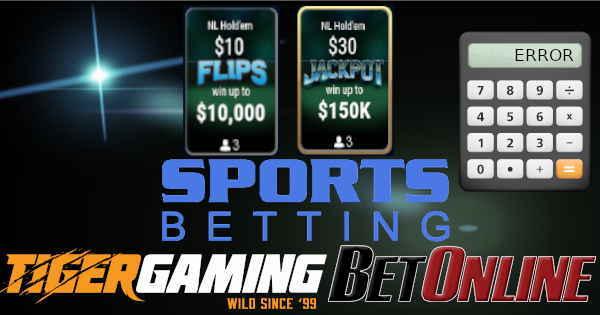 The jackpot amount is distinct for each of the four buyin levels offered: $3, $6, $15, and $30. There's another line indicating “Jackpot Madness: $1,026.04,” but we don't know what this is referring too. We also have no idea what to think of the “CURRENT JACKPOT: $7,500.00” displayed on the websites of the Chico poker rooms. This seems to be just a made-up number. There's no indication anywhere on the websites of the CPN operators or in the poker client as to the frequency with which the jackpot is activated. This doesn't affect the overall EV of the format because everything collected in jackpot fees is eventually paid out to the players. Yet, the varying size of each jackpot undoubtedly will make for situational +EV and -EV spots at each level. Value hunters would certainly appreciate info about the jackpot frequency so that they could better perform the necessary calculations. 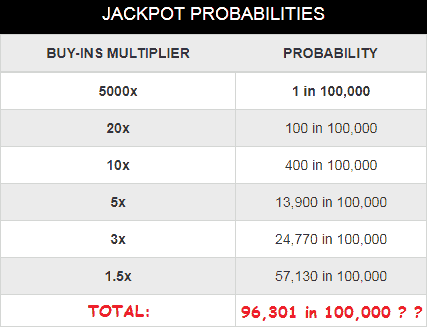 Unlike in normal Windfalls, where the multipliers range from 2x to 2,000x, in these new Jackpot games, the permitted values span from 1.5x up to 5,000x. Curiously, when the 5,000 figure is hit, this leads to a prize pool greater than that of the actual jackpot, which is currently only between 370 - 605 times the buyin at every stake listed for this variant! In order to perform our analysis of Jackpot games, we studied the publicly available info on the various multipliers offered and the probabilities of each of them occurring. We didn’t get too far along in our work, however, when we noticed something amiss in the chart showcased on the Sportsbetting.ag website. 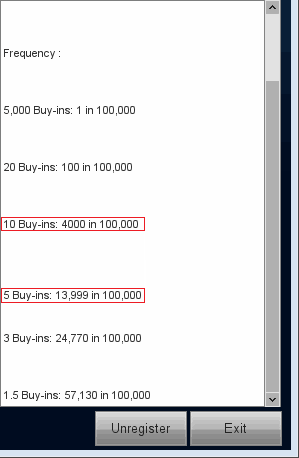 As you can see from a copy of this chart shown below, the total frequencies, per 100,000 Jackpots, of the multipliers added together don't equal 100,000! Indeed, there appeared to be 3,699 out of 100,000 games that were unaccounted for. We furiously added, subtracted, multiplied, and divided in an attempt to test out various hypothetical reasons, like perhaps a missing multiplier value, to explain this phenomenon. We had no luck until we saw that there was a breakdown of the multipliers and frequencies in the Jackpot lobbies within the poker client. 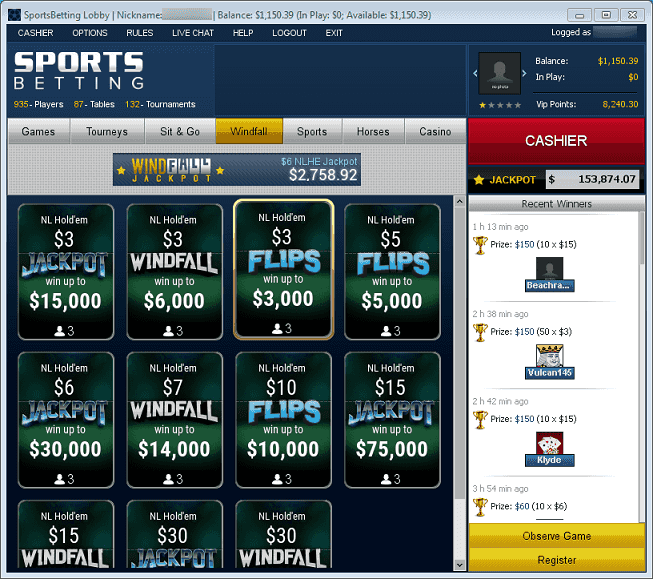 You can view the correct data, which we have gleaned directly from the poker software, to the right. The lines that are different from what's indicated on the website are outlined in red. It seems that simple typographic mistakes, along with a troubling degree of carelessness, were to blame. Bolstered by our success in getting to the bottom of these shenanigans, we continued to perform our computations to bring you an accurate overview of Jackpot Windfalls. Yet, we soon observed something else that was awry. For comparative purposes, Sportsbetting.ag shows a table of multipliers found at “other poker sites” – and this resource was sloppily constructed too! Really, Guys, How Hard Was It to Copy+Paste? The second new type of game in the Windfall lobby is called Flips. These are, as their name might imply, all-in fests where players start with just a single chip, and the winner is decided in just a few seconds. 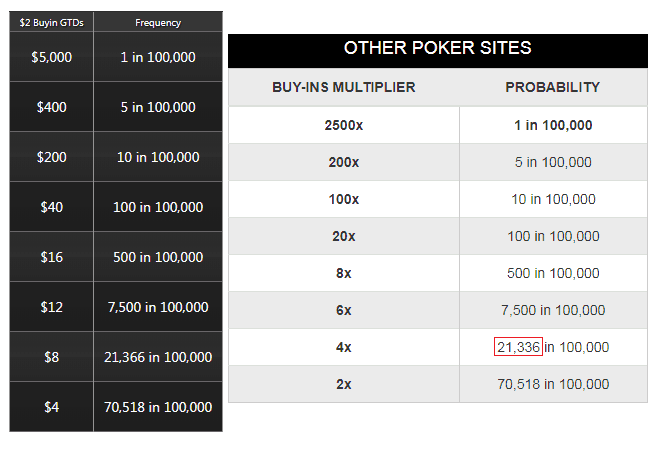 They too include a randomly chosen multiplier, which can be as low as 1.5x and as high as 1,000. Flips are offered at three price points: $3, $5, and $10. The average fee is equal to 5.6% of the total buyin. It's a commonplace maxim of poker wisdom that “flippaments,” as they are sometimes known, are just luckfests where exactly zero player skill comes into play. We're mostly convinced by this popular idea, but there's a unique aspect to the Chico Poker Network's flip tourneys that enables participants to utilize their poker abilities at least to a small degree. After crunching the numbers, we've concluded that the element of skill present is minor at best, and it would be impossible for anyone to realize a positive return on investment in the Chico Flips games. If you're curious or masochistic enough, you can click the plus sign below for a full description of the exploit that we found and the mathematics justifying our assertion that it's not worth bothering with it. 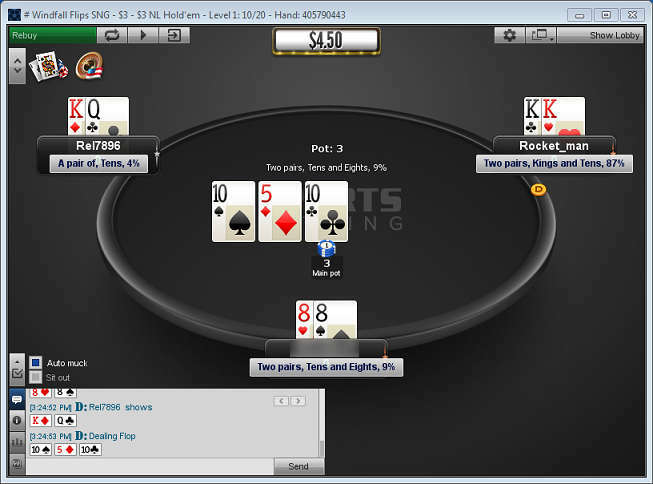 Each Flips game begins with a high card draw for the dealer button, which is irrelevant in most flip-style sit-and-goes because everyone is all-in every hand. But in these particular Flip games, the person on the button actually has the option to fold! The other two individuals in the hand are forced to put their puny, one-chip stacks in the middle because of the blinds. In analyzing this situation, we note that folding from the button will cause you to be heads-up in the next hand with one-third of the chips (just 1 solitary chip) while your opponent will have two-thirds of them (2 chips). Because the probability of winning a heads-up freezeout is identical to the fraction of the total chips you possess, your likelihood of winning the Flip if you find yourself on the button in the first hand and fold is 33.33%. This range comprises 44.3% of all hands, and it has 41% equity against your opponents' random hands, which translates into a 41% chance of winning the Flip (we'll ignore for now the effects of a split pot because this is an unlikely outcome and it doesn't change the results much). Folding is conversely indicated 55.7% of the time. By playing in this manner, you can increase your winning percentage from the average 33.333% up to 34.465%. Now it's time to see if this advantage is enough to beat the rake. Using the $3 Flips as an example, $2.83 of every buyin goes to the winner, on average, across the entire spectrum of multipliers. The other $0.17 is the fee. The winner will receive $2.83 * 3 = $8.49 in general although the variance will be quite high. So, 34.465% of the time, you'll win an average of $8.49. Your overall expected value is therefore $2.93 (34.465% * $8.49) while your buyin is $3 for an expected loss of around $0.07 or an ROI of -2.33%. You'll make back some of the rake you pay, but securing a long-term profit in these games appears impossible. Even this mediocre result of clawing back a portion of the fees is predicated on your opponents not being familiar with correct button strategy in Flips, which won't necessarily be the case all of the time. Of the Chico Network's two new Windfall-inspired games, we counsel everyone to take a pass on the Flips. They're basically just a crapshoot with a 5.6% house edge. If this is your cup of tea, then you might as well just play casino slots, which have a comparable negative player expectation but with the benefits of superb graphics, fun bonus rounds, and intriguing themes. Head over to our rundown of the top U.S.A.-friendly internet casinos for more on this topic. The Jackpot format is more worthwhile. The total fees are 7.67%, more than normal Windfall's 7%. Still, 2% of this goes toward the progressive jackpot pool, which isn't raked at all. The amount retained by the site is just 5.67%: noticeably less than in regular Windfall. Between the larger spectrum of multipliers and the possibility of hitting the jackpot, these games will appeal to those who love variance. If this is you, then by all means hit the “Register” button in earnest. If old-school Windfalls satisfy you more, then you're not making a big mistake by avoiding Jackpots. If you aren't currently playing at the Chico Poker Network, then we urge you to do so today. 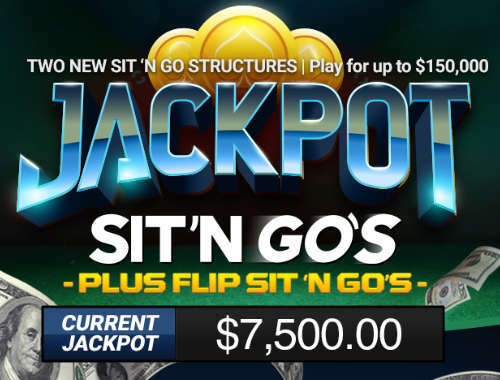 Not only can you partake in Flips and Jackpot sit n' gos, but there's a full product menu at these companies, including cash games up to $10/$20, many guaranteed tournaments and even non-poker gambling like sports and casino betting. Our preferred CPN brand is Sportsbetting.ag, and you can learn all about it with our SB.ag Poker review. Non-U.S. residents have a virtually identical platform they can play at called TigerGaming. For other similar poker amusements, read our list of the best lottery SNG providers. If you're not interested in these types of games, then head over to our USA offshore poker sites guide for a comprehensive rundown of the rooms available to Americans for internet poker.